The Advanced Smile Institute of Port St Lucie, FL provides fast, effective, and affordable teeth whitening treatment. The Pola Advanced Teeth Whitening System gives you a whiter smile and helps remove stains on your teeth. We are offering the Pola In-House Whitening Treatment for a special price, so please be sure to contact us for more information. This special also includes the Pola Day / Pola Night take home trays, which are a fantastic way to maintain your white smile. Advanced Smile Institute of Port St Lucie FL makes custom fitted trays to allow you to whiten your teeth at home during the day. You can wear the trays with Pola Day inside for as little as 30 minutes a day (depending on the concentration we supply you with). You repeat this procedure for about 5 - 10 days depending on requirements. This makes it possible to whiten your teeth before you go to work, clean the house or cook a meal! Advanced Smile Institute of Port St Lucie FL makes custom fitted trays to allow you to whiten your teeth at home whilst you sleep. You can wear the trays with Pola Night inside overnight or for as little as 40 minutes a day (depending on the concentration your doctor supplies you with). You repeat this procedure for about 5 - 10 nights depending on requirements. 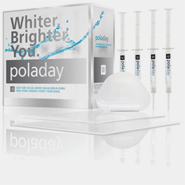 For more information on the Pola Advanced Teeth Whitening System, please visit PolaWhite.com. To start treatment or find out more on pricing, please contact Port St Lucie dentist Robert Lens DDS of Advanced Smile Institute for advanced teeth whitening Port St Lucie FL. Advanced Smile Institute specializes in advanced, modern dentistry for all ages. Contact us now to set up your first appointment! Copyright © 2016 Advanced Smile Institute. All rights reserved. Marketing by Vivid Mint.